When you need business cards for your Syracuse, NY business or organization, you can count on Seaboard Graphics for the best quality at great prices. You only have one opportunity to make a first impression, so make sure your business card is a perfect reflection of your brand. You need your business card to be a conversation starter, something that people want to keep and act on. Let Seaboard Graphics create the business card that will connect you to both potential and existing clients when you’re networking in the Syracuse, NY area. You can trust in the quality of Seaboard Graphics, too. Our business cards are high quality, full-color and custom printed. You can provide us with your own press-ready files, or you can work with our talented design team to create the perfect design for your business or organization’s identity. Find out about the kinds of business cards we offer to Syracuse, NY businesses and organizations. 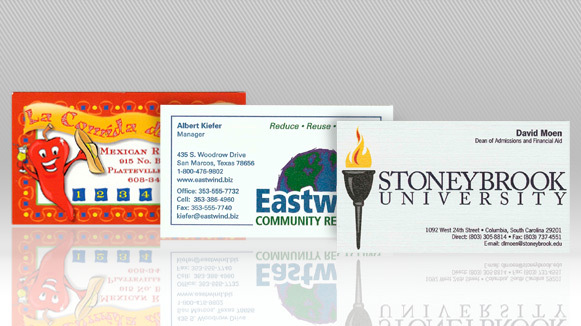 Our business cards are high quality, full-color and custom printed. You’ll be able to work with our talented design team to create a design that suits your identity, or you can feel free to provide us with your own press-ready files. Either way, Seaboard Graphics can help you make a great first impression. Call us at 800-721-1663 or fill out this convenient online form, and we will be happy to assist you.